The music of Minnesota perennials Curtis and Loretta comes straight from the heart. 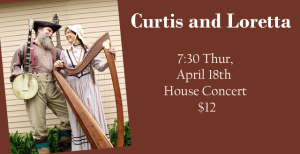 They are extraordinary and proficient on a parade of stringed instruments, which create an alluring frame for their poignant original songs, and carefully chosen traditional pieces from the British Isles, America, and beyond. Their current instrumental menagerie includes Celtic harp, mandocello, mandolin, guitar, clawhammer banjo, and National steel ukulele, plus a bit of kazoo, harmonica, and shakers.